We are starting to see social democrats grow in popularity. Individuals like Bernie Sanders, Beto O’Rourke, Alexandria Ocasio-Cortez, and Ilhan Omar have become extremely popular. For the most part, their views and policies align with those of many of America’s Founding Fathers, insofar as they advocate progressive taxation and government taking a role in social welfare. While they admire Nordic Model social democracy, they especially look to Franklin Delano Roosevelt’s New Deal as an example of what social democracy ought to look like in America, which means that they depart from European social democrats on things like corporate income taxes (American social democrats usually support high corporate income taxes, whereas European social democrats tend to oppose corporate income tax altogether). Some of these individuals—Sanders and Ocasio-Cortez in particular—have described themselves as “socialists.” Ignorant conservatives have used this label as grounds for mocking and deriding them. In reality, these new social democrats are just classical republicans, in the tradition of the American Founding Fathers. Previously, I wrote a couple essays about the political and economic ideas of Thomas Jefferson and Thomas Paine. In those essays, I discussed how Jefferson was a critic of wage slavery and wealth inequality, how both Jefferson and Paine opposed what we call "capitalism" today, and how they both advocated progressive taxation as a means of ensuring a more egalitarian distribution of wealth. I also talked about how the Founding Fathers supported a robust welfare state. Even John Adams, the most conservative of the Founding Fathers, supported an early plan for single-payer socialized medicine. The bottom line is that the precedent for everything that these new social democrats are advocating comes more from the American Founding Fathers than from Karl Marx. Now, nearly all of this is rejected by social democrats. Eduard Bernstein, the founder of modern social democracy, rejected all of this Marxist doctrine with the exception of "historical materialism," whereas most modern social democrats reject even that. (Karl Popper, who has influenced many modern social democrats, has actually written several books refuting "historicism.") Bernstein had been a student of Marx and Engels, but he was no uncritical disciple. He argued that Marxist dogma was wrong. He still called himself a "marxist" and a "socialist," because he regarded historical materialism as the essence of Marxism and regarded socialism as the movement to eliminate the exploitation of the working class. (2) that the profit-motive under capitalism does encourage employers to provide low wages and cut corners on safety, but that liberal democracy also tends towards universal suffrage (the right to vote) and that this allows the working class to raise their position through democratic means—the workers end up voting for progressive politicians that implement policies to ensure workplace safety and decent wages; thus, the immiseration of the proletariat will never take place. Some social democrats, like Sanders and Ocasio-Cortez, call themselves "socialists" for the same reason that Eduard Bernstein called himself a socialist—because they identify with the spirit of socialism, the fight against exploitation and inequality. This liberal and loose use of the term "socialism" was popularized by Anthony Crosland and is still used by many social democrats. While this usage of the term socialism does have historical precedent, going back to at least 1899, I think it is much better and far less confusing to go the route of Giddens and describe social democracy as third-way radical centrism. This third-way radical centrism really resonates with the ideas of the American Founding Fathers, who like the social democrats were neither neoliberals nor socialists. Anthony Giddens, one of the leading proponents of social democracy in the 20th century, argued that classical social democrats tended to expand government and that this was a mistake. Instead, third-way radical centrist social democrats ought to apply the principle of subsidiarity. As you may know from my other writings, "subsidiarity" is the notion that all matters ought to be managed by the smallest unit of organization/government capable of effectively managing it. This is a principle that has guided confederalists and distributists. I believe that Giddens' emphasis on decentralization is, perhaps, part of the reason that MMTer have proposed a federally-funded job guarantee program with decentralized administration. This emphasis on decentralization is important and it is yet to be seen whether the new social democrats in Washington are going to pay tribute to this doctrine of subsidiarity or not. It is worth noting that both Sanders and Ocasio-Cortez have ties to (or have been influenced by) MMTers, so it is likely that they have been influenced by this way of thinking. Nevertheless, the failure of the new social democrats in Washington to expressly address the issue of centralization/concentration of power is disconcerting, though not as disconcerting as the attempts by everyone else in politics to deliberately centralize power for nefarious purposes. Social democrats, like Giddens, are advocates of "dialogic democracy" or what Karl Popper called the open society. Advocates of "social democracy" and advocates of "the open society" will find a lot of room for agreement. They are both proponents of liberal democracy. While Popper does not identify as a social democrat, he is within the liberal democratic tradition to which social democracy belongs. Popper contrasts tribal societies ("closed societies"), which do not openly trade and interact very much, with "the open society" of liberal democracy. The emergence of liberal democracy had begun in ancient Athens and was responsible for the dissolution of closed tribal societies. Athenian imperialism and commerce went hand-in-hand with democracy. (Cf. Karl Popper, The Open Society & Its Enemies, Chapter 10, Section 2) Government and imperialism were essential to creating money and establishing commerce, so Athenian imperialism was linked to Athenian commerce. But, seafaring and commerce created an open society in which various tribes and peoples interacted. Such interaction tended to undermine superstitions and the tribal institutions that were based on them. It became harder for shamans and chiefs to control people and impose their authority as society became more open. Consequently, the more open society became, the harder it was for oligarchs to maintain their privileged position or for governments to appear legitimate to their subjects. Larger markets and greater commerce require more democratic systems in order to establish legitimacy of government and keep the people from revolting. Within the open society, it becomes necessary for governments to establish legitimacy through democratic means in order to maintain order. In order to govern in an open society, persuasion becomes far more important than brute force. Ideally, a liberal democracy will be a dialogic or deliberative democracy in which decisions are made rationally, based on meaningful discussion. Liberal democracy strives for rational government rather than arbitrary government or government by force. As globalization broadens, markets expand to their maximum extent, and the open society reaches its full potential, it becomes necessary to implement more deliberative and participatory forms of democracy in order to maintain order. Karl Popper recognized that "rational social engineering" was necessary insofar as some form of government is necessary for an open society to exist, but he distinguished between utopian engineering and piecemeal engineering. "Utopian social engineering" is what socialists and anarchists propose, when they seek to totally destroy the established order and start over from scratch—the utopian wants to engineer a new society from scratch. "Piecemeal social engineering," on the other hand, is more in line with Giddens' philosophic conservatism—it seeks to make smaller changes and gradual reforms rather than overarching utopian revolutions. The piecemeal social engineer can convince people to support his proposed reforms and get them imposed democratically, with popular support. This renders violent revolution unnecessary and maintains social stability and security while making improvements to the social order. It is much easier to get a majority of people to support a single policy or reform proposal than it is to get a bunch of people to support an overarching vision for rebuilding society from scratch. It is much harder to get a majority of people to agree on what an ideal society would look like than it is to get a majority to agree that a particular tax reform proposal is desirable. Liberal democrats and social democrats agree that this approach of gradual, practical reform is preferable to utopian revolution and the restructuring of society based on theoretical models. Popper, like Giddens, presents a vision of liberal democracy that strikes a balance between the left and the right, between progressivism and conservatism. On the one hand, he recognizes that injustices exist within the current system and that change is necessary. On the other, he recognizes that stability and security are desirable and ought not to be sacrificed for the sake of revolutionary change. The traditions of social democracy and liberal democracy occupy a place in the middle, between left and right, like Karl Marx coming to terms with Edmund Burke and both rejecting the left/right dichotomy in favor of a radical centrism that is both conservative and progressive. These new "socialist" politicians in America represent this same tradition of liberal democracy and social democracy. They are not actually socialists at all. 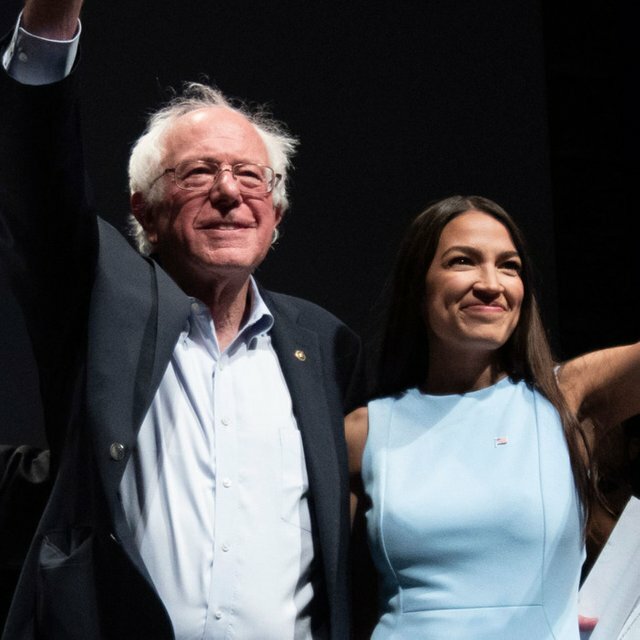 Sanders, O'Rourke, and Ocasio-Cortez comprise the radical center. The fact that they are viewed as the "far left" in America just demonstrates how much Americans have been brainwashed by rightwing extremism. Commenting on this Story will be automatically closed on March 4, 2019.